Called "Dobro's matchless contemporary master," by The New York Times and lauded as "my favorite musician" by no less than rock legend John Fogerty, Jerry Douglas could have been a musical innovator on any number of instruments. However, as a teenager, Douglas adopted the relatively obscure and unexplored Dobro, and that decision has helped him carve out a unique place in American music. By discovering the capabilities of this expressive instrument during a period of intense creativity in acoustic music generally, Douglas has wielded incalculable influence on bluegrass and its many related genres. His transcendent technique and his passionate musicality have helped him net twelve Grammy Awards and numerous International Bluegrass Music Association awards. Douglas holds the distinction of being named Musician of the Year by The Country Music Association (2002, 2005, 2007), The Academy of Country Music (ten times), and The Americana Music Association (2002, 2003). In June 2004, the National Endowment for the Arts honored Douglas with a National Heritage Fellowship, recognizing his artistic excellence and contribution to the nation's traditional arts. 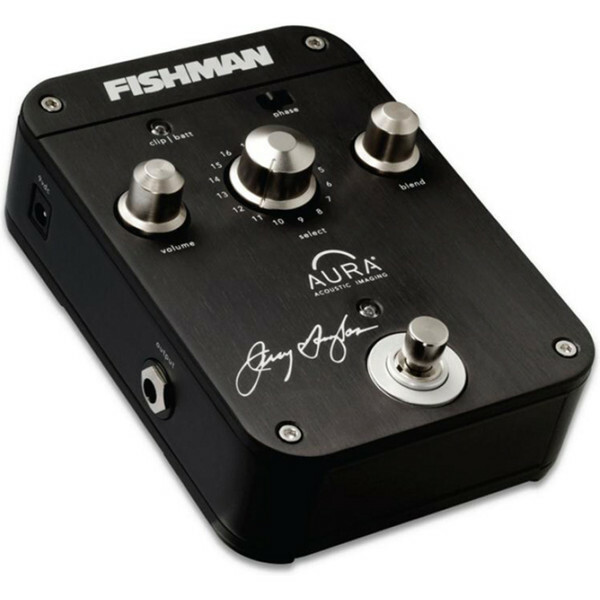 16 custom Fishman Aura Images created and used by Jerry Douglas specifically for resophonic guitars. AUDIO I/O: 1/4 inch stereo input and output, Input Level control, 24 bit A/D/A.